Welcome to Bagatelle New York, a restaurant that is wholly French Mediterranean in atmosphere & cuisine. In the heart of the Meatpacking District, Bagatelle (One Little West 12th Street) mixes luxury and joie de vivre inside a chic neighborhood bistro. 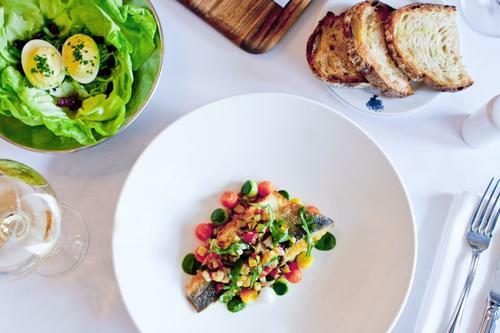 This New York City institution, which is also the flagship location for the global brand, transports guests to the South of France, delighting diners with unmatched service and outstanding seasonal cuisine. Upon walking in to Bagatelle, you are enveloped by a bright and chic ambiance, from the cream-colored bar adorned with colorful flowers, to the tan banquettes with crisp white linens. Art courtesy of the Opera Gallery lets you know that Bagatelle is even more than meets the eye. There’s nod to excess throughout, which is most famously brought to you by Bagatelle’s brunch. Bagatelle’s unparalleled weekend brunch has paved the way for the week’s most entertaining meal, transforming mid-day brunch into an all out blow out social event. Guests can sip champagne and dance with friends, all the while sampling French classics like Croque Monsieur, or break with tradition and try a unique twist like Matcha French Toast with Sake-infused White Chocolate Mousse. If lunch or dinner is more your speed, Bagatelle has plenty of options from land and sea to choose from. The Organic Grass-Fed Truffle Chicken is one of their signature dishes, whole-roasted and fragrant, not to mention the perfect item to share. If you’re looking for a lighter bite, there’s a wide selection of oysters, crudo, and tartares, as well as charcuterie. And for those who bring their appetites, there’s the Black Angus Aged Porterhouse for two that comes with three sides. We suggest the Pommes Aligot, a French classic that combines cheese and potatoes into a dish that is velvety and rich. There’s nothing like a smooth cocktail to wash down a decadent French meal, which is why Bagatelle takes pride in their specialty drinks. Let the bubbles flow with their signature Rich & Famous brunch cocktail, made with Belvedere Vodka, lime juice, muddled apples, and cucumbers, topped with Vueve Cliquot Rich champagne. This cocktail matches the high-energy brunch at Bagatelle, but there’s nothing stopping you from having a simple glass of Sauternes. One of Bagatelle’s most popular cocktails is the Bootie Call, which is refreshing and sweet and certain to have you ordering a second. Bagatelle has long been the epicenter of the jet-setting culinary lifestyle. From models and artists, to brokers and bankers, guests will discover a variety of dishes that tempt the palate, as well as a delicious assortment of signature cocktails and an impressive wine list. The city that never sleeps needs a great soundtrack as well, so when the sun goes down, Bagatelle’s unique music program features world renowned DJs that promise to keep you entertained and enlivened all through the night. After a decade in the Big Apple, Bagatelle reminds guests daily of the unique and magnetic ambiance that made it famous. The corner real estate in this prime area of Manhattan makes it hard to miss, so whether you’re visiting for dinner or their world famous weekend brunch extravaganza, you are sure to have an unforgettable experience.